Getting more light where you need it has never been easier! The unique design of the Universal Strip Light Hanger makes mounting the light you need, a snap! 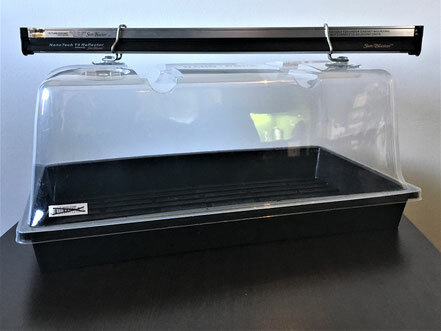 Eliminate the need for cumbersome metal shades that not only weigh a lot, but also trap heat and block your view of your garden or propagation areas. Add as much light as your crop desires, up to seven T5HO’s or LED’s with this simple easy to use, and easy to suspend, lighting accessory from SunBlaster. 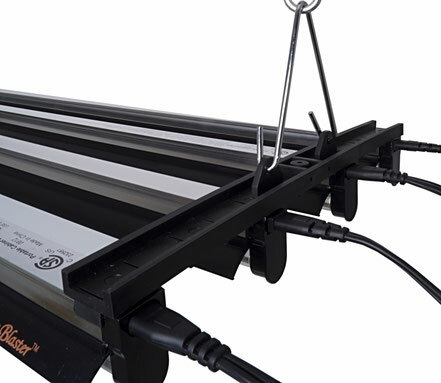 SunBlaster Universal Light Strip Hangers can also be wall mounted or back to back to provide optimal supplemental side lighting between your rows. SunBlaster Universal Strip Light Hanger’s accommodate any length of SunBlaster™ T5HO Combo’s and our New LED Strip Lights. That's what makes them Universal! Each kit includes two strips and two V Hooks for easy suspension. 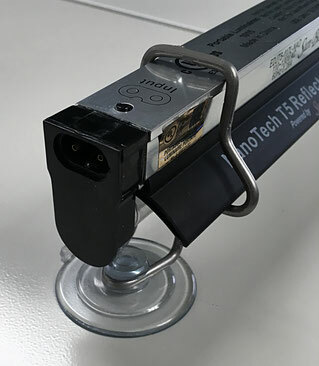 SunBlaster Strip Light Hanger with T5HO Combos clicked into place and interconnected via the linking cords. Strip Light Hanger with four T5HO Combos connected to our Hang It racket pulley. 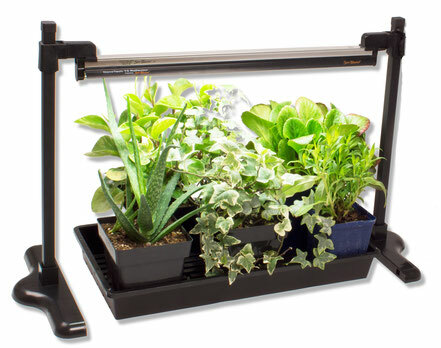 The Universal Strip Light Stand allows you to set the exact lighting height to get your seedlings or fresh cuttings off to their best starts ever. Simple adjustment makes setting the correct height quick and easy. As your seedlings or starts get growing you simply slide your lighting upwards to the desired height. Made of durable injection molded plastic and rust proof, powered coated aluminum to provide years of dependable performance in your growing environment. The Strip Light Hangers attaches easily when you need to get more than a single light over your growing area. The Strip Light Stand works with both SunBlaster T5HO and LED Strip Lights. Strip Light Stand ~ Shown with our 18" T5HO combo, 1020 Quad Thick propagation tray and some house plants that are loving the light and growing happily! Strip Light Stand shown with the optional Strip Light Hanger installed holding four T5HO Combos. SunBlaster Lighting Acessories allow you to build exactly what you want and need. Getting the right light to your Seedlings and clones has not always been an easy task, we get that. The Light Grip ~ Suction Mount is a Strip Light securing accessory that makes your propagation just a little easier. 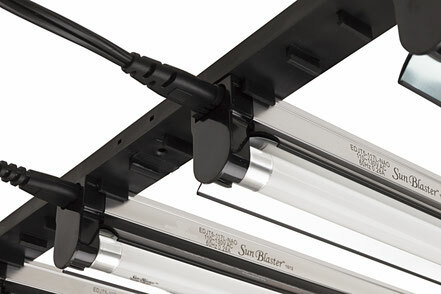 Our SunBlaster LED and T5HO Strip Lights are the chosen light source for many indoor growers today. Two suction cups secure the lighting brackets to your humidity dome or any other smooth surface that you wish to mount your light to. 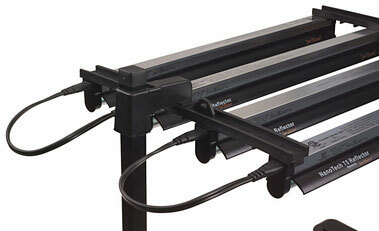 Your SunBlaster LED or T5HO Strip Lights simply slide in through the brackets to your desired position. Keeping your lighting in place is now a much simpler process thanks to these Light Grips with Suction Mounts! Our Light Grip ~ Suction Mounts attach easily to any smooth humidity dome or growing camber. Hang Its from SunBlaster make light height adjustment a breeze! These ratchet pulleys are Heavy Duty with suspension capacity of 75 lbs. per pulley. Two pulleys are provide per pack for a combined capacity of 150 lbs. Now you can suspend your SunBlaster lighting over your growing area, with easy access to height adjustment. The clip on carabiner's provide for easy installation and removal of your lighting fixture. 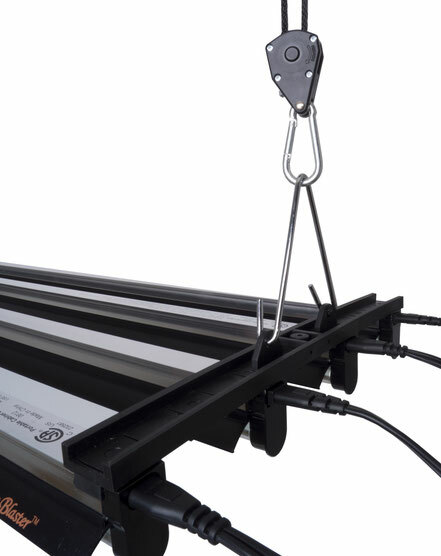 SunBlaster Hang It's can be used to suspend a wide variety of overhead hardware and other hardware used in your growing environment.